Life As A Fangirl: The Year I Was A G.I.S.H.W.H.E.S Proxy! The Year I Was A G.I.S.H.W.H.E.S Proxy! 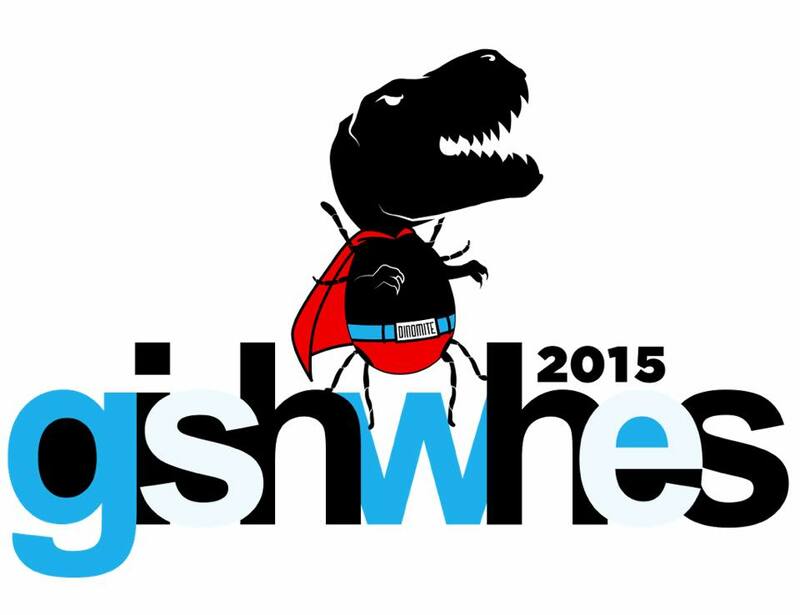 Each year, actor Misha Collins does something EPIC called GISHWHES. (Stands for Greatest International Scavenger Hunt the World Has Ever Seen!) I've wanted to participate for the past 2 years now but have always been on a book deadline. DRATS! 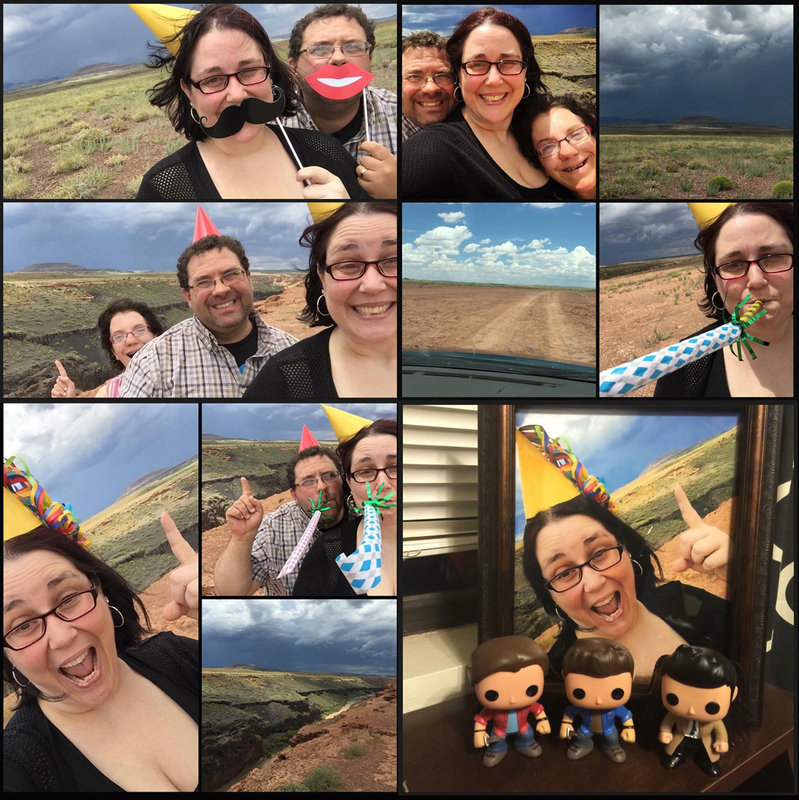 This year, because I lived close-ish to one of the challenges, I was asked to be a GISHWHES proxy! And man, did I learn a lot as well as having an INSANE amount of fun. One of the challenges Misha set was for people to get a photo of one of James Turrell's projects and "celebrate the sky". Luckily, about an hour from Flagstaff, James purchased the property that has Roden Crater on it. Roden Crater is a cinder cone for an extinct volcano. Pretty cool huh? So when I was asked if I could go there and act as proxy, I said NO WORRIES! Looking at my trusted Maps app, it was about 3 hours away ... easy peasy. <<< yes, I am the person who doesn't mind driving that long for someone. Everything was going well. The driving instructions were pretty basic and we were all in high spirits. My sweet hubby had no idea what was going on, other than I'd volunteered to go take a photo. My daughter had the day off and agreed to come along. Once we'd finished with Roden Crater, the plan was to drive over to Flagstaff to eat and check out bookstores. It's always interesting when your Maps app tells you to turn right onto a highway that resembles the entrance to a private property. Yep, that should've been my first indication that things were about to get REAL. No worries. After doing a U-turn because we totally missed it, we headed down the 7 miles of road ... if that's what you would call it. First, we had the 'washboard' ridges that almost rattled our car to pieces. Next came large rocks throughout the 'road'. Finally, I guess the road decided it wasn't fooling anyone and became a dirt road with a mud cracked surface. It was all good though because it wasn't too far to our destination. I think I should explain now that in my mind, Roden Crater was this official site with a fancy sign and fence. My plan was to show up, take my photo with my props, and leave. So we're heading down a CRAZY highway that really wasn't. All was fine until my Maps app stopped working and by stopped, I mean it kept rerouting! With the little info I could still see, Roden Crater was only 4 miles away but now it would take us AN HOUR to get there. Did we give up? No. We kept going. Now our internet service stopped. So much for 3G and 4G. We were in the middle of NOWHERE, no service, no reliable map, committed to the cause, and ... now I had to use the bathroom. We finally pulled up to a big gash in the earth, or what people liked to call Grand Falls. Looking out over the surrounding area, all we could see was low scrub. No roads. No big neon flashing sign that said "HERE IS RODEN CRATER!" "We're going to die!" <<< yep, probably not the best thing to joke about. "Where the hell is this thing?" Then I remembered the screen shot I had on my phone about Roden Crater and pulled it up. I'm not ashamed to admit that I stood there, going around in circles, trying to match it to the hills I saw around me. Based on comparison, estimation of distance from my still not working Maps app, and sheer desperation, we were able to determine where Roden Crater was!! Move over Sherlock Holmes, my powers of deduction are MAGNIFICENT! Attached are some of the photos we took, including my FAVORITE family photos EVER! I loved them so much I then went out and printed them. They're now hanging on my wall. We finished taking our photos, again relying on every piece of good karma we'd accumulated, and checked to see whether they would do. They were perfect. MISSION ACCOMPLISHED. Level AWESOME achieved! So, about that lesson. Did you catch it amongst my story? So many times we focus on challenges and everything that goes wrong. We grumble over poorly paved roads. We panic when things don't work. We give up when we think we're lost. At any time I could've turned around and apologized to my friend. I know she would've understood. I'm pretty sure Christina was wondering whether she'd sent me off to my doom. I could've given into doubts and defeat. I could've done A LOT of things - most reasonable given the situation. I did the best I could with a smile on my face. I chose to still have fun and laugh. I chose not to sweat the little stuff, trusting we would be okay because even though it felt a little scary, we really were safe. I can't imagine how I'd feel if we'd just turned around when we first started down the path. What I do know is I would've missed out on THE BEST DAY me and my family have had in a while! We still joke and laugh about it and I now have cherished memories. I learned that what may be an inconvenience to others, isn't for me. I'm perfectly fine being the friend who goes that extra mile. I like who I am and because of that, I did something I wouldn't have done. I'm also a believer in the Law of Attraction - that I hold the power to create the kind of life I want. I don't always know HOW it will come, only that it WILL. For a while I've been saying I wanted to do fun road trips and take photos. VOILA! This is what happened! And a side note, Misha wanted the photo to reflect celebrating the sky. For those of you who followed along with the Facebook album I uploaded, I pretty much did EXACTLY that. I took some of the most amazing sky photos ever! As a result, I'm considering submitting some to magazines. Anywho, this was my secret mission, secret only because I couldn't speak up until after GISHWHES finished. To those who participated, I hope you had a BLAST! I had so much fun doing this that I'm determined to participate fully next year. Crazy geek + GISHWHES = INSANITY! I can't wait to see what happens!